It still feels weird to type Oakland Raiders at Los Angeles Chargers for a game in Los Angeles — but that’s how the schedule lists it, so it’s what we’ll go with. Coming off their first win of the 2018 NFL season, the Raiders should have new-found confidence as they face the 2-2 Chargers in their second divisional game of the season. While the Chargers entered the season as the divisional favorites, that mantle has quickly been taken by the undefeated Chiefs — especially as the Chargers have floundered early on. That said, the season is still young for both teams and a win in this game would be a massive step towards re-entering the playoff race — especially with the other team a potential competitor. Whenever the Raiders travel to Southern California, the fact that it’s listed as a road game seems to exist simply as a formality. And now, with future home Las Vegas just a few hours away, I’m fascinated to see (hear) what the StubHub Center looks (sounds) like. The Chargers never made sense in Los Angeles — while the Raiders did — and so if the Raiders can get a little home-field cooking going, it might be exactly the edge they need to come out on top. If you follow the Raiders closely, you’ve probably read this stat countless times this week: Derek Carr leads the league in interceptions with seven. And while I’d love to forget it, the fact is it’s true and it might remain true for a little while longer (although Andy Dalton and Case Keenum both trail Carr by just one pick). While most national writers have buried the Raiders already, those who have followed this team closely know how close they were to winning both the Denver Broncos and Miami Dolphins games. Of course, they didn’t, but it’s safe to say that Carr’s carelessness with the football made a big difference in that. Even last week, in a game where there was probably a bit more margin for error, Carr still wasn’t great at protecting the football — throwing two interceptions and nearly fumbling. No franchise in the league has had worse luck kicking the football than the Chargers over the past few seasons and 2018 has been more of the same story. While Caleb Sturgis is 7/9 on the season kicking field goals, he’s an abysmal 6/9 on extra points (last season, for context, the Chargers missed one-third of all field goal attempts in addition to five extra points). For the Raiders, they’re on their third kicker of the season with undrafted rookie Matt McCrane having taken over kicking duties last Sunday. While his NFL debut was a bit shaky, the overall line was impressive (3/5 FG, 4/4 XP) — especially considering his two misses were long field goals off the dirt. Oh, and he just-so-happened to kick the game-winner in overtime. With what’s expected to be a close game on Sunday, it’s a safe bet to assume that one of these kickers is going to be involved in a big play this weekend. The question of the week is: Which Amari Cooper is going to show up? Can this be the week that he finally strings together consecutive monster performances? When he finally shows, can he can be a consistent receiver with star potential in this league? This season, the Chargers passing defense has allowed 8.7 yards per passing attempt (29th in the league) and 10 passing touchdowns (26th in the league). On paper, this has all the makings of a big week for Cooper and Carr, but before we write that one in pen, let’s see it happen twice in a row. It’s no mystery that the Raiders defense hasn’t been great. They’re a weird mix of rookies and aging vets — all trying to learn a new defense while playing an inordinate amount of snaps — and yet, there was a stretch against Cleveland on Sunday when things seemed like they were clicking. When you see it all listed out, it’s really pretty astonishing. In 10 drives, the Browns scored just 14 points, turned the ball over three times and had five three-and-outs. While no one will look at a 45-42 score and think ‘what a great performance from the defense,’ I think that might actually be what was deserved. For the Raiders to really turn their season around, they’ll need to put together stretches like this just to give their offense a chance to outscore people. Given, facing a rookie quarterback in his first career start, at home, is different than traveling to face Philip Rivers, but Paul Guenther and Co. are going to need to find a way to manufacture stops anyways. The Chargers beat a hapless 49ers team by just two points last week and their only other win was against the Bills. I really do think that losing the weight of being winless will have a massive impact on the Raiders — allowing them to play more freely and less scared. 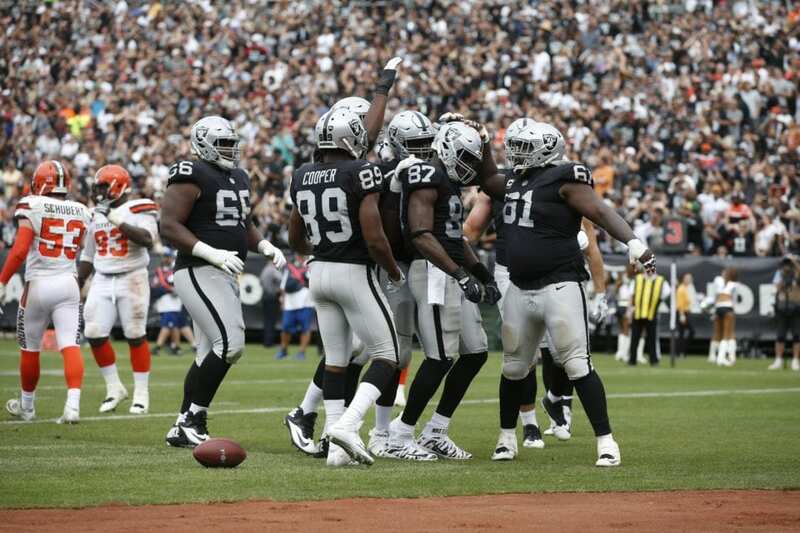 I also think that every single week we’ll see improvement as the Raiders continue to learn a new offense and defense. Combine all that with the Black Hole in Los Angeles, and I think the Raiders play their most complete game of the season and come up with a big win.